Spiel + Freizeit Zinthaefner in Ludwigsburg is my favorite shopping stop whenever I'm in the area. They are the last real toy store left in town, and for good reason. The in-stock selection is superb throughout the store, and of course I could spend an hour in the model train department alone. 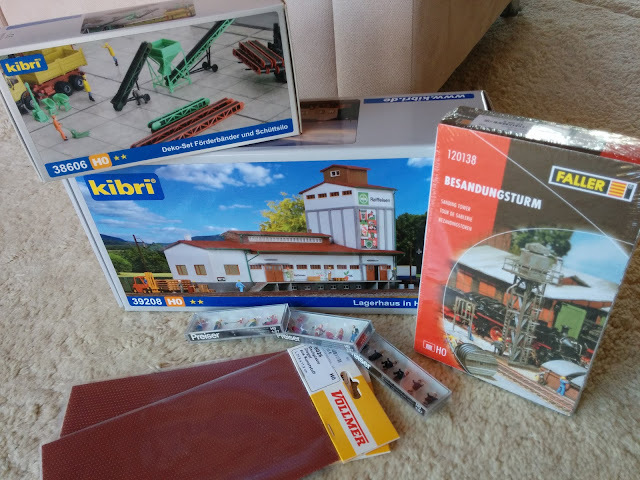 Well, I did spend an hour in the model train department mostly browsing the wide selection of building and accessory kits from Kibri, Faller, Auhagen, Busch, Vollmer, ... I could do the same online and prices might be a bit cheaper, but nothing beats seeing the real thing. Kibri's WLZ storage building and a conveyor set, Faller's sanding tower, as well as a few Preiser figures, and Vollmer tile roof sheets. The WLZ building is planned to replace the freight shed I built a few years ago, currently acting as a stand-in for Meyer Landhandel in Talheim. The shed turned out to be too small to be believable as a freight house in Emsingen, and has the same problem in Talheim. The WLZ building, while still a bit underscale, should have more presence in the scene.